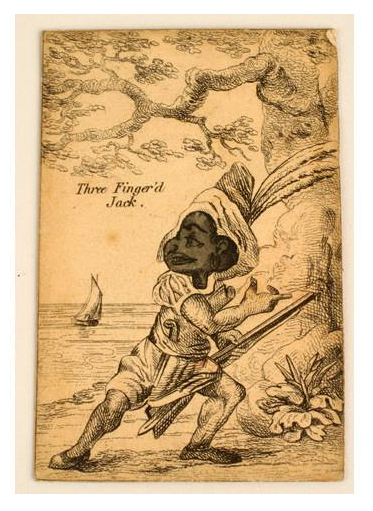 ‘Three-fingered Jack’ was the popular name of a man who escaped Jamaican slavery some time before 1780, became a leader of a group of maroons, and was captured and killed. His story can be traced in the Jamaican Royal Gazette. It was introduced to the British public through a section of a book by Dr Benjamin Moseley, A Treatise on Sugar, published in 1799, which describes Jack’s use of ‘obi’ to maintain his power. Moseley’s account of Three-Fingered Jack inspired the very successful stage pantomime Obi, or Three Finger’d Jack, which first played at the London Haymarket Theatre in 1800. Two novels based on the story were published that same year, and the story was then told and retold through further pantomimes, theatrical productions, chap books, juvenile literature, novels and other cultural productions. Jack’s use of obeah formed a significant element in most of these retellings. 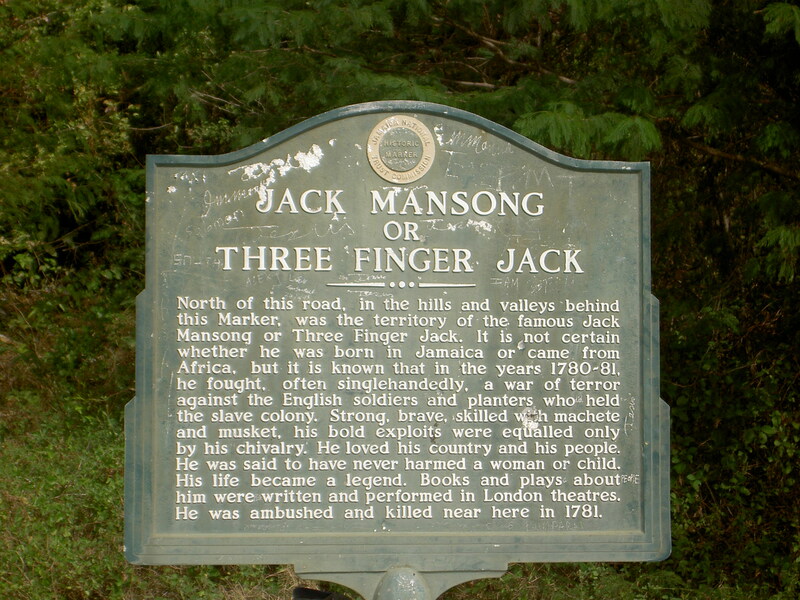 In 1980 Three-Fingered Jack’s story was staged in Jamaica in that year’s Jamaica National Pantomime production, Mansong, which retold the story with Mansong/Jack as a freedom fighter. The actor Charles Hyatt played the central role of Dada. This page presents a few images related to Three-Fingered Jack, highlighting the range of ways in which the story was represented and entered into popular consciousness. This playing card forms part of the collections of The New-York Historical Society Museum and Library. This card might have originally been one of a pack of cards representing different pantomime characters from 1801-1808. An auction catalogue of items from the Collection of the Late Charlotte Schreiber, including Political, Educational and Fanciful cards of Italy, England, Germany, France and Other Countries, by Sotheby, Wilkinson & Hodge on 1 May 1896 lists a ‘Fanciful Pack. 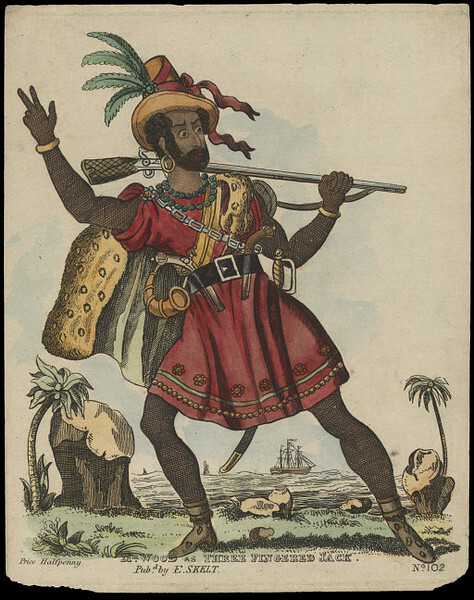 Transformation of Playing Cards, some of the illustrations represent characters from The pantomimes, &c. of 1801-8 — Mother Goose, Three Fingered Jack, &c.’ Jack is represented wearing a feathered turban, suggesting a blurring of ideas about the exotic. This hand-coloured etching is a portrait of ‘Mr. Wood as Three Fingered Jack.’ Mr Wood was probably the actor Joseph Wood, who was depicted in several other roles. It was produced in London and published in the mid-nineteenth century by E. Skelt. It forms part of the Victoria and Albert Museum’s Harry Beard Collection. The Museum of London owns a similar image, dated to 1850-1872. ‘Juvenile theatres’ were small theatres for young people – popular during nineteenth century Britain, which could be cut out from sheets of paper – Skelt was one of the main producers of these theatres sheets and so this etching may be related somehow to a cut-out juvenile theatre. One of the common Juvenile theatres was a version of the popular pantomime Three-Fingered Jack. of Italy, England, Germany, France and Other Countries. London: J. Davy and sons, 1896, http://archive.org/details/catalogueoldpla00elvegoog, site accessed 6 January 2013. Speaight’s the History of the English Toy Theatre.’The Lion and the Unicorn. 11.2 (1987): 111-127. Stevenson, Robert L. Memories and Portraits. New York: Charles Scribner’s Sons, 1895. Digitised edition at http://www.robert-louis-stevenson.org/essays site accessed 18 January 2013. Early Pantomine, Victoria & Albert Museum, http://www.vam.ac.uk/content/articles/e/early-pantomime/ site accessed 18 January 2013. Paton, Diana. Histories of Three Fingered Jack: A Bibliography. Very educational. Three-fingered Jack was somebody very special. He did great things, in just a year, apparently because he inspired people to write about what he did and they made money telling his story. It would be nice to know why he did not become a National hero. Was it because people did not know him well enough? I met a man (Rastology) today, July 31, 2018 (in Mandela Park) who told me about Three finger Jack. I found the story very interesting. There are so many stories about free slaves and the Maroons that are not told or known. 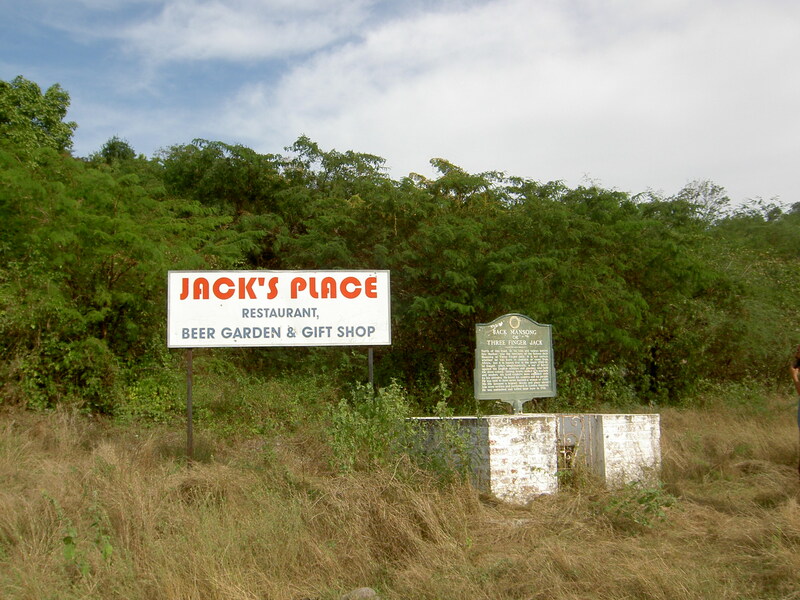 The monument dedicated to Jack should have a tourist visitors’ sight erected to draw more attention to the area and provide revenue to build and improve St. Thomas, the parish I call Jamaica’s stepchild. Looking for investors. I am in.